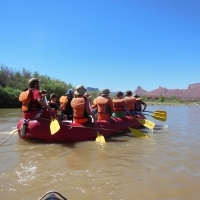 View Details Be our guest on the Colorado River as we treat you to Moab’s most popular whitewater, a tasty riverside lunch, and magnificent scenery made famous by scores of movies and commercials. View Details Don’t be put off by the name! This canyon is chock-full of not just abundant whitewater, but also fascinating history, scenic hikes, dazzling canyon views, beautiful wilderness camping, and incredible dutch oven meals. 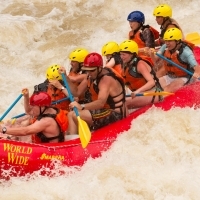 View Details In the heart of its black depths, you’ll shout with adrenaline-fueled joy as you ride through rapids with exotic names like Funnel Falls, Sock-It-To-Me, Last Chance, Skull Rapid and the Room-of-Doom. View Details Deep in the heart of Canyonlands National Park, the Green and Colorado Rivers combine forces to carve stunning canyon walls and create some of the biggest whitewater in North America. 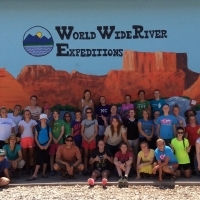 Thank you for visiting World Wide River Expeditions! The available dates for the 3 day 2 night Fisher Towers and Multi-day Scout adventure are now available online to reserve from their respective pages. 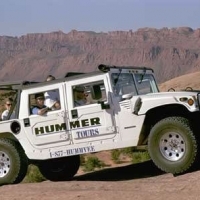 ALL dates in June are full for overnight trips, except for Cataract Canyon the last week of June. If the trip does not show up on the calendar in either red or green it is not available on that date. There is still lots of availability for the 1-day trips throughout the summer and reservations for groups can be made through the Youth Group link. Reservations can be made online for all available trips from the trip page using the Check Availability link. The Girl's Camp information is still listed below as we work toward updating our website. If you have any other questions please email us and we will get back with you as quick as we can. We appreciate your patience and look forward to 2019! 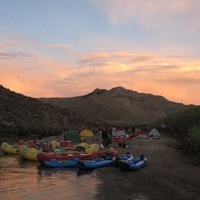 The meeting time will be 11:00 AM at the campsite you will be staying at for the 3 days and 3 nights you are on the river with us. Guides will meet you there where you can quickly set up camp and have lunch while everyone changes into their river clothes. The bus will come about 12:30 to take you to the boat launch. From there you will have a fun day floating back toward camp. 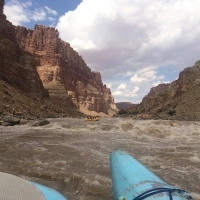 On day two your group will float the fun Moab Daily section (Fisher Towers) of the Colorado River. After a short time playing on the beach your group will be transported back to camp. On day three, the morning is available for self guided activities in camp or a self-guided hike around the Fisher Towers just across the road from camp. Lunch will be back in camp, and the afternoon will again be on the river with our guides until about 5 pm. On the last day your group is free to go after breakfast. For more detailed information visit 3 Day 3 Night Girls Camp for the trip documents. "The high level of expertise and experience that your company has is obvious. I was impressed with the planning and execution of every phase of our trip. We had a fantastic time! Thanks for a wonderful vacation!"